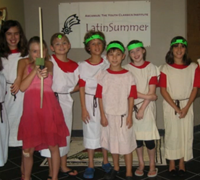 LatinSummer 2013 features a brand new curriculum! 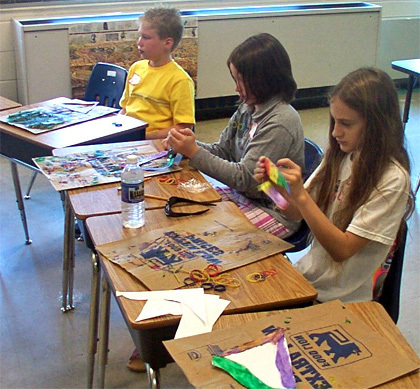 At LatinSummer, students will explore the classical world through fun, creative, innovative, and hands-on activities. The curriculum will feature three main topics: ancient Roman culture, Greco-Roman mythology, and Classical & Conversational Latin. 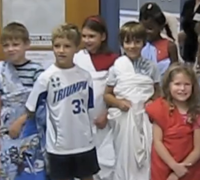 Topics include: Latin vocabulary and roots, hands-on Latin sentences, Olympic games, Roman clothing, gladiators, architecture, banquets, mosaics and art, gods and goddesses, and more! See Lessons from Previous Years! See LatinSummer in Two Minutes! Students will be assigned groups by age. Instruction, pacing, and content will be tailored to the unique needs of each age group. The program's hands-on and exciting classes will be taught by creative, enthusiastic high school and college Latin students under the supervision of experienced teachers.